Nick Hardwick scooted down the steamy corridor, one of the first Chargers exiting a jubilant locker room. The Bolts had bounced the Seahawks, but it was Hardwick taking flight late Sunday afternoon, which was noteworthy. Often Hardwick, the Chargers’ longtime center, was the last man standing in the sea of cubicles. Make that sitting, as after three hours of wrestling with defensive tackles, a man deserves a chair. But without fail, Hardwick, in various stages of getting undressed, would offer the seat next to him. He would dissect the game, talk of its importance and explain the nuances of football so anyone — even dumb sportswriters — could understand it. But that Hardwick is history. Instead he’s leading the post-game charge from the locker room instead of exiting with the guys collecting soiled towels. Hardwick’s season is gone and with him goes a glorious piece of Chargers lore. He aggravated a neck injury in the opener, which forced the team to put him on the injured-reserve list. His season, and possibly career, is over. And I couldn’t be sadder. Sad because Hardwick was a go-to guy, someone with the intellect and experience to examine football with a keen eye. He was also a Pro Bowler, which meant he was the best of the best. Happy because he was also a family man, someone loving his wife and two young sons as much as he did wearing pads on Sundays. For that reason — considering his serious injury — I’m ecstatic that Hardwick isn’t playing anymore. He’s probably got the first nickel he made — a flashy lifestyle wasn’t this Midwest mauler’s style. He got 10 years and an opening day in the NFL. And he played on some of the best Chargers teams ever, the anchor of an offensive line which made Marty Ball hip. Hardwick brought more than four quarters of determination to each game. He was a leader, a man’s man, and the reaction of him not being along for this year’s ride is sinking in. Teammate Philip Rivers, as we’ve learned, isn’t good about his hiding his emotions. Rivers’ halting voice when speaking of Hardwick’s fate illustrated what he meant. 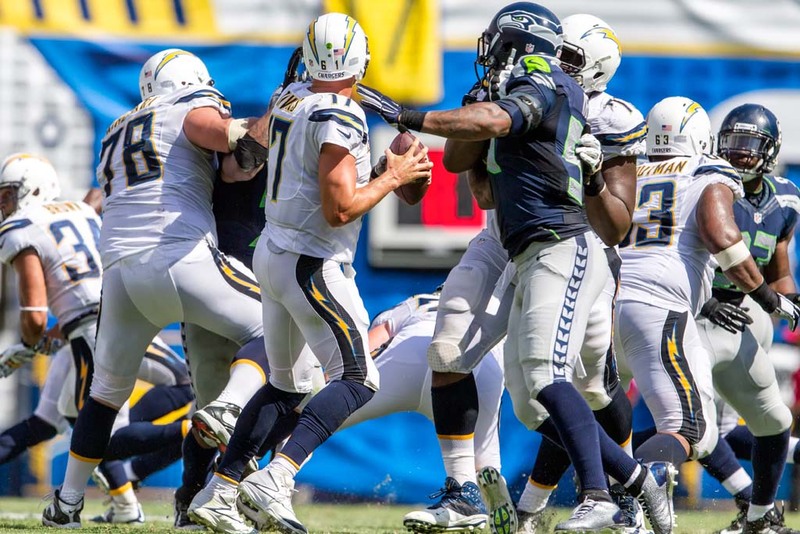 Then came Sunday, when the Chargers’ sweet-throwing No. 17 wore the numbers 6 and 1 on his helmet: Hardwick’s number. With the NFL being in the nation’s conversation for all the wrong reasons, Hardwick provides the balance. Yes, the sour news is just that. But not all NFL players are guys you wouldn’t want your sister or kids with. Hardwick took his responsibilities seriously on and off the field. The big ugly in the trenches was really a big teddy bear, and just ask kids losing their parents about him. For years Hardwick worked tirelessly for the Marine Corps Law Enforcement Foundation. It raises funds for the offspring of those killed protecting our freedom and protecting our streets. Hardwick spent a decade keeping Rivers and others from harm’s way. But Hardwick’s commitment to guarantee those mournful children had money for college trumps anything he did between the sidelines. So while Hardwick wasn’t on Sunday’s microwave-like Qualcomm Stadium turf, he was. Rivers made sure, with his helmet number not consistent with the one on his white jersey. Hardwick deserves our praise. While others will remember Rivers’ three touchdown passes, I was touched by Rivers’ compassion. If only briefly, let those disturbing NFL stories take a hike, so we can cherish a center. Hardwick was always aware of the big picture, thanks to his big heart. Contact staff writer Jay Paris at jparis8@aol.com. Follow him on Twitter at jparis_sports.